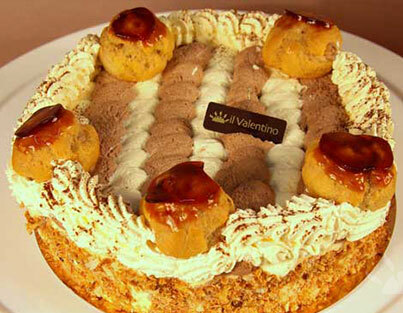 "Ice Cream Cake" is a typical Italian approach to dessert, where the cake is served at a temperature of circa 4'. 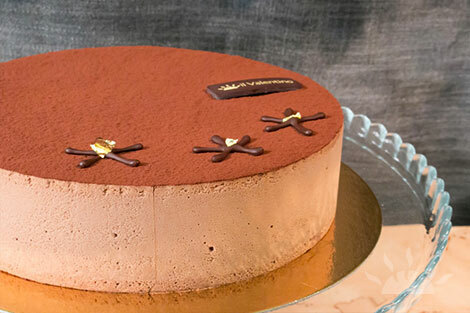 It has the texture of frozen mousse and is equally elegant and delightful. 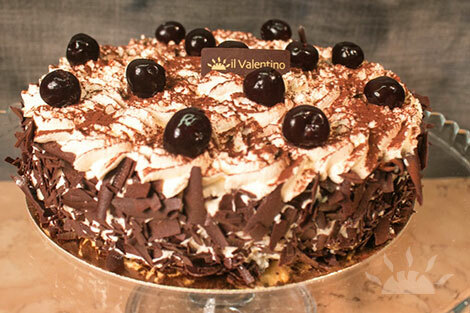 Black Forest gâteau consists of several layers of chocolate sponge cake sandwiched with whipped cream and cherries. 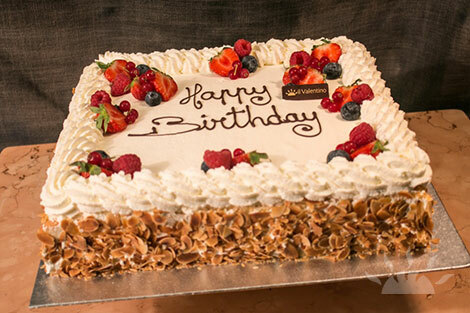 Decorated with whipped cream, amarena cherries and chocolate shavings. Pan di Spagna Italian sponge, Belgian Dark Chocolate, fresh Chantilly cream, Amarena cherries. Wheat, eggs, milk, may contain nuts or nut traces, soya traces. A colourful savoiardo biscuit cake completed with white chocolate vanilla mousse, white chocolate and raspberries ganache,topped with fresh strawberries/ berries. White Chocolate, strawberry puree, cream, eggs, flour, sugar, glucose syrup, Vanilla from vanilla pods. Savoiardo biscuit. Eggs, milk, may contain nuts or nut traces, may contain soya traces. 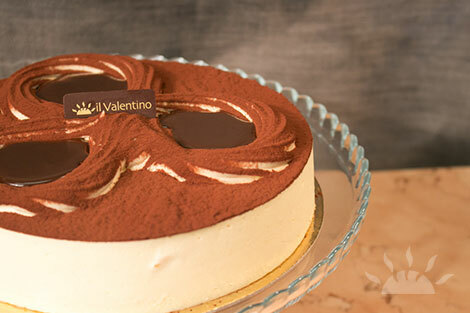 The iconic italian dessert, with Mascarpone and vanilla cream, chocolate sponge and chocolate ganache. Dairy, eggs, may contain nuts traces or soya traces. 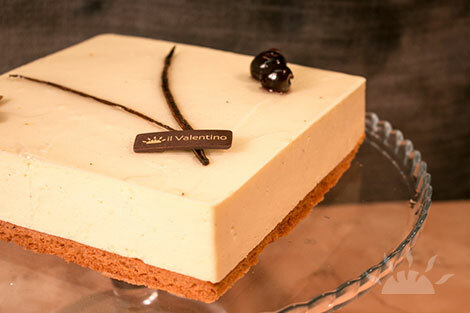 Our Cherry Cheesecake is a mixture of soft, fresh cheese, amarena cherries all on a crumble biscuit base. Eggs, vanilla from vanilla pods, soft cheese, fresh cream. Biscuit base with ground almonds. Flour, Milk, eggs, nuts. May contain soya traces, nuts traces. 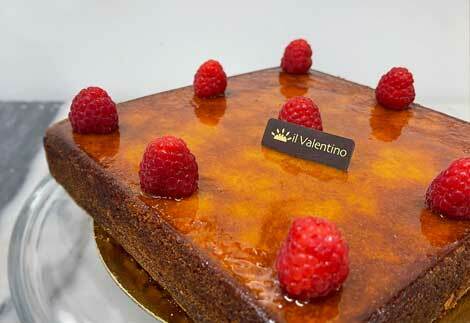 Outstandingly beautiful cake, dedicated to art and impressionism. 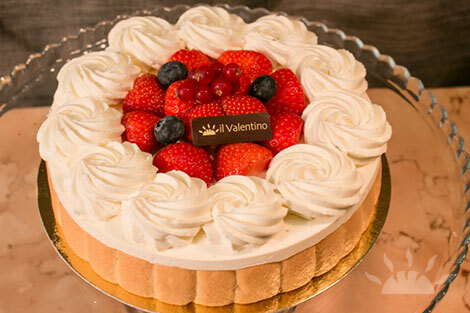 Vanilla Italian Chantilly, mixed berries, sponge, fruit gellee. Eggs, vanilla from vanilla pods, fresh cream, berries. Biscuit base with ground almonds. 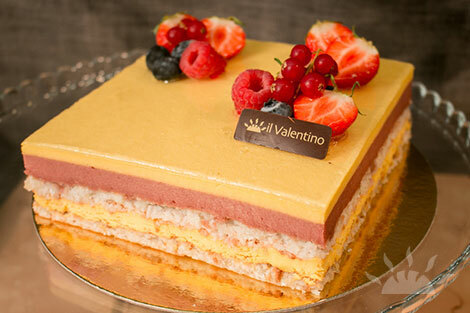 A layered bavaroise on a coconut biscuit base, delivering the freshness of strawberry, the tanginess of mango fruit and the nutty roundness of coconut. Nuts, Dairy, Egg. This cake does not contain flour. 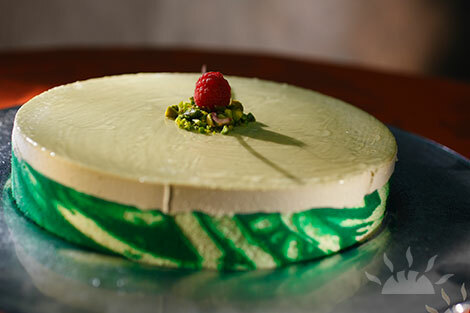 Pistacchio Bavarese, layered with almond biscuit also called "the Mona Lisa biscuit". 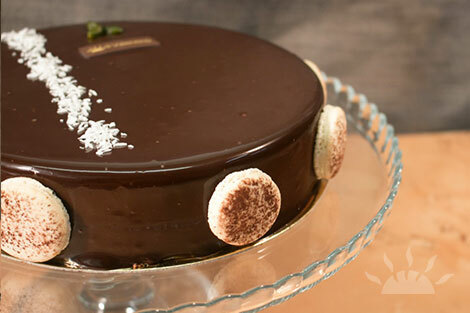 A chocolate mousse with two crunchy layers of dacquoise covered with chocolate, praline paste and crunchy feuilletine. 'Semifreddo' cake to be left 3 hours in the fridge before serving to achieve ideal texture. Serve at 4 C.
Flour, Almonds, Sugar, Egg, Milk. Hazelnut, Butter, Cornflour, Fresh Cream. Some of the most popular "classics" that have been enjoyed for centuries across Europe, with recipes exchanged and improved across countries and chefs. 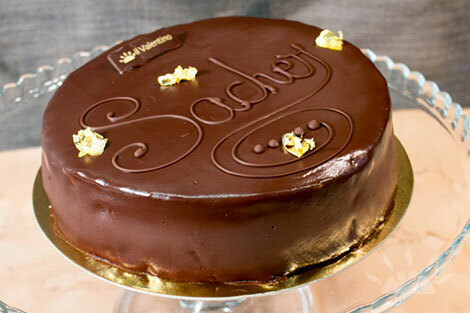 The fame of Vienna, this original Sacher Torte is a combination of two layers of dark chocolate (belgium, 70%) sponge, separated by a layer of Italian apricot jam and coated with a dark chocolate ganache. Flour, 70% Dark chocolate, eggs, almonds, creme fraiche, butter, honey, apricot jam, sugar, chocolate ganche. Ready to eat. Store in fridge until serving. Flour, butter, pastry cream, chocolate drops, vanilla from vanilla pods. Flour, cream, eggs. May contain soya traces, nuts traces. 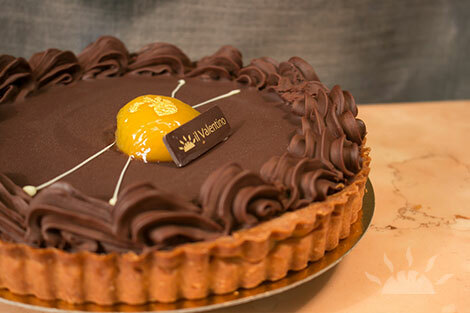 A French classic, layers of mille feuilles puff pastry filled with Chocolate and vanille chiboust cream, a layer of sponge covered in chantilly cream (chocolate and white) topped with caramelized vanilla bigne. Puff pastry, choux pastry, butter, sugar, cream, caramel, Chantilly cream. Wheat, eggs, milk. May contain nuts or soya traces. One of the prettiest French classics, never fails to impress with its colours and geometries. Strawberries, vanilla creme mousseline, Italian Pan di Spagna sponge base, strawberry glacage fresh fruits decoration. 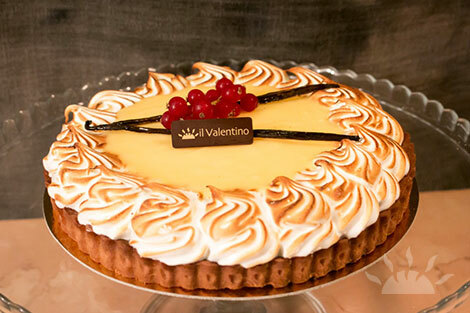 Sweet shortcrust pastry, frangipane almond filling, lemon curd, passion fruit, Italian meringue. Flour, Butter, Sugar, Egg, Vanilla, Lemon puree, Cream. Dark Chocolate, Apricots, Flour, Butter, Sugar, Egg, Vanilla from pods. 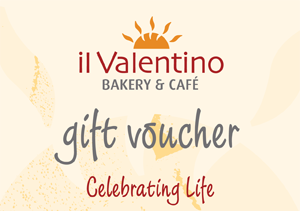 Catering for 8, 15 or 30 persons, customised with your message. 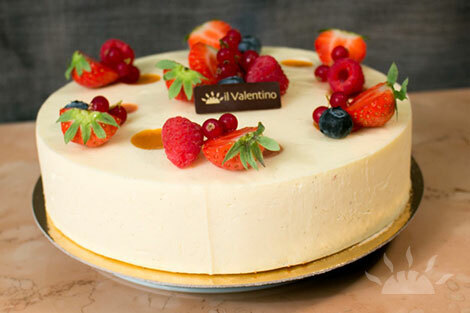 Versatile and easy for any occasion, Italian Pan di Spagna (sponge), with a choice of three variants : strawberries, chocolate or mixed fruits. 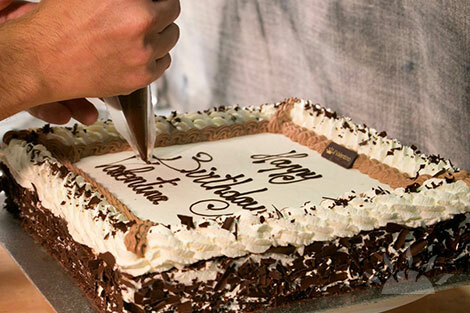 A Italian Pan di Spagna sponge soaked in syrup, filled with Chocolate Chantilly covered in whipped cream, personalized on request. Italian sponge (Pan di Spagna), flour, eggs, sugar, strawberries, cream. 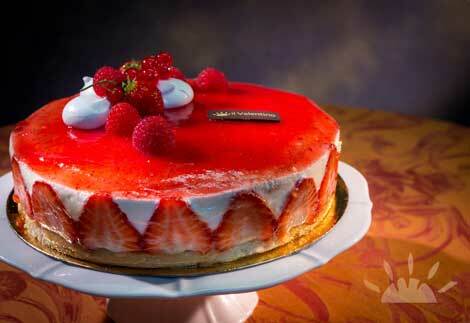 A sponge soaked in syrup, filled with Chantilly cream and strawberries, covered in whipped cream. Personalised on request. 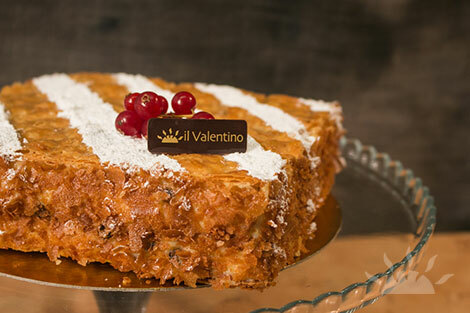 Italian sponge (Pan di Spagna), roasted almond flakes, flour, eggs, sugar, strawberries, cream. NEW - Coming Up soon !